Green Fees: £7.50 - 9 holes, £11 - 18 holes (weekday). £8.50 - 9 holes, £13.50 - 18 holes (weekend). Offers: Tuition and play packages available for groups and societies. Discounts available for juniors (under 16). Please ask for details. 18 bay floodlit and covered driving range. Fully stocked pro shop (Recommended Wilson Staff Custom Fit Centre and Authorised Adidas retailer). Practice facilities including putting green and short game area. Equipment hire. Full catering from on site coffee shop. Expert PGA tuition available 7 days (2 full time PGA professionals). A challenging layout awaits you on our course, with every hole offering a different test. Two tier greens built to USPGA specifications and rivetted bunkers will provide a stern examination for the accomplished golfer, water hazards and the addition of over 500 trees give the new golfer a stimulating environment to learn the game over a manageable 1'500 yard nine-hole golf course. 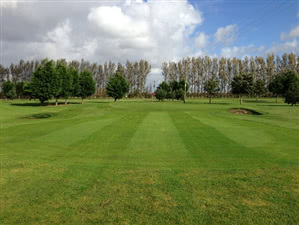 We are one of the best draining courses in the area so quality golf is available 12 months of the year. Great course for beginners - but a fair challenge if you can play! This set up is ideal for anyone learning the game - good mix of par 3's pretty much all the challenges you would find on an 18 hole course. Kept in excellent condition, greens good - all weather tee's. Very welcoming and helpful - plenty of practise area and covered range. We had a great society day and included coaching as part of it.Nice little cafe and useful private room for group presentations - no clubhouse as such but great little pub at the end of the road!